Thomas Charlesworth (Tom) was born on 17 June 1897, at 16 Storm Street, Sheffield, and was baptised at St Peter’s Church, Abbeydale, on 14 July of that year. He was the eldest son of Thomas Charlesworth, a steel toy grinder, and of Fanny Charlesworth, née Le Bond. The family lived on Storm Street until around 1905, then on Turner Street, and by 1913 they had made their home at 198 Arundel Street, where they would remain until the 1930s. At the time of the 1911 census, Tom was aged 13 and working as a glass cutter. Later documents show that he became a journeyman wireworker. Shortly after war was declared, Tom volunteered for service with the Royal Field Artillery in Warrington and was given his number on 2 or 3 September 1914. He was only 17 years old at the time, but like so many other young men he lied about his age in order to enlist. His intake was sent to begin training with 25 Reserve Battery which was under command of 5A Reserve Brigade R.F.A. at Athlone in Ireland. Tom would probably have completed his training with this unit before joining a draft for France. The letter was written in pencil on four sheets of 9” x 8” paper. There is no date attached to the letter, but the last thing Thomas mentions is the change to his rank which took place on 14 March 1916, so it was probably written soon after then. The letter is transcribed as it was written, with no changes to spelling or punctuation. His report of a German attack on the Notts & Derbys followed by a British counterattack is an accurate description of fighting that took place in the Ypres salient between 14 February and 2 March 1916, an engagement known as “The Bluff”. The original letter was donated to In Flanders Field Museum in 1995 (then known as Herinneringsmuseum). I went home from that position just after getting back from leave the Germans gassed us that was the first time we ever had gas it is terrible stuff had one man gassed went mad was running about undressed in the streets which were under heavy shell fire they were shelling with gas shells. Our battery had one gun hit and a sergeant killed and an officer his arm took off had four hit with shrapnel. After that we were three days on the road and went to Ortergues a small village between St Omer and Calais had one month their. Whilst their our battery was fished out of the 2nd Army to go to Calais firing experimenting cutting barbed wire were we were very successful had a good time in Calais was only 2 miles from town went in Calais a couple of nights I’ll tell you that visit was quite the talk of the battery After that rest we went back to Ypres about ¾ of a mile out of town we had only been there about a week when the Huns though they would be awkward started shelling extra heavy then one night they sprung 5 mines and had a bombing attack captured our front line you will have noticed it in the papers it said the Ypres – Commines Canal and the railway that was where we lost the trenches the Notts & Derby’s were the chief sufferers came out about 200 strong lost about 100 prisoners. Later that year, Tom was wounded and evacuated to England, and from August to November 1916 he was a patient at Whitecross Military Hospital in Warrington. By early 1917 he was at Frome in Somerset, presumably at No. 7 Depot R.F.A. which was based in that area, but he returned north and on 8 February was married to Isabel May Savage at St Thomas’ Church, Stockton Heath. Tom had intended to reside in Stockton Heath after the war had ended, but he never got the opportunity and was sent back to the front in April, about a month or so before the birth of his son, Thomas Benjamin. 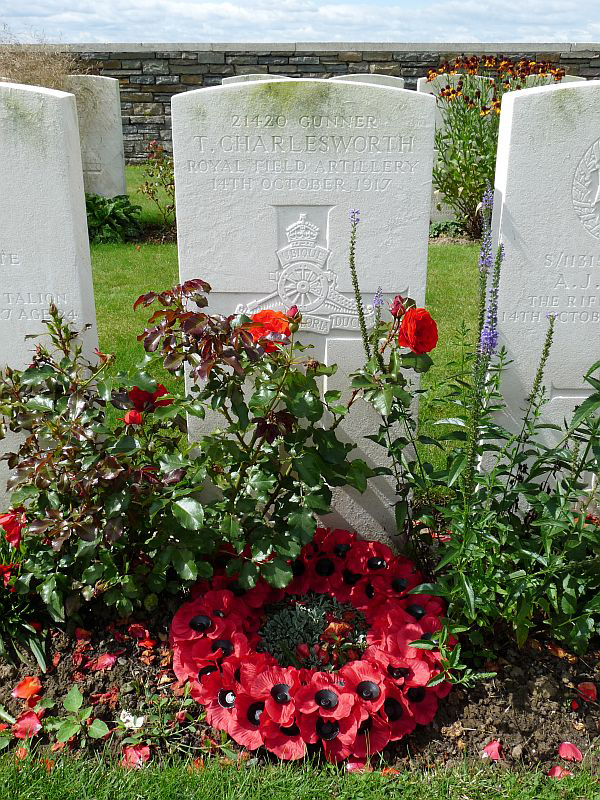 Tom died of wounds on 14 October 1917, at the age of 20. He was fatally wounded during the Third Battle of Ypres, probably on 13 or 14 October, and would have died while on his way to a medical unit in the area, or perhaps at one of the Advanced Dressing Stations clustered along the Ypres canal. He is buried at Solferino Farm Cemetery, where he lies in plot 1, row B, grave 38. 1. 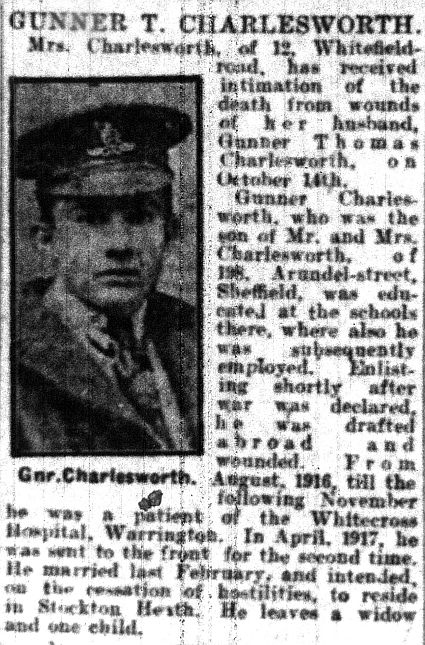 Soldiers Died in the Great War states that Thomas enlisted in Sheffield, however the casualty list in The Times (3 December 1917) says Warrington. His service number suggests that Warrington is correct.